Mortgage Bonds, their demise and rebirth.....are we ready for this? Some of the financial instruments that are widely viewed as having played a major role in the severe recession of 2007-2008 are rushing back into favor with lenders and big banks. Will their resurgence lead to a different outcome this time? That was the question addressed during “Mortgage Bonds, their demise and rebirth.....are we ready for this?” a talk given at the Columbus School of Law on Oct. 30 by John Arnholz, a senior partner with Bingham in its Washington DC office and a former adjunct lecturer in the Catholic University Securities Law Program. 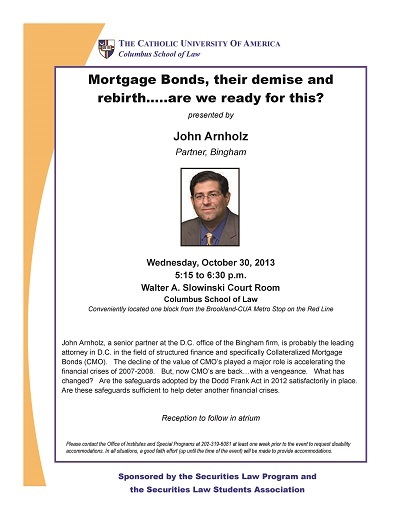 Arnholz, John, "Mortgage Bonds, their demise and rebirth.....are we ready for this?" (2013). Securities Law Program Lecture Series. 11.